Medium of choice: Primarily DJing but also dancing a lot of club styles, like house and vogue. I also do event organizing. Simeon Jacob is all about movement. Sometimes that manifests in twisting and swaying his own body through dance or setting the mood for others do the same while on the ones and twos. Other times, he’s running long distances or dedicating himself to the movement of environmental justice and climate change activism. 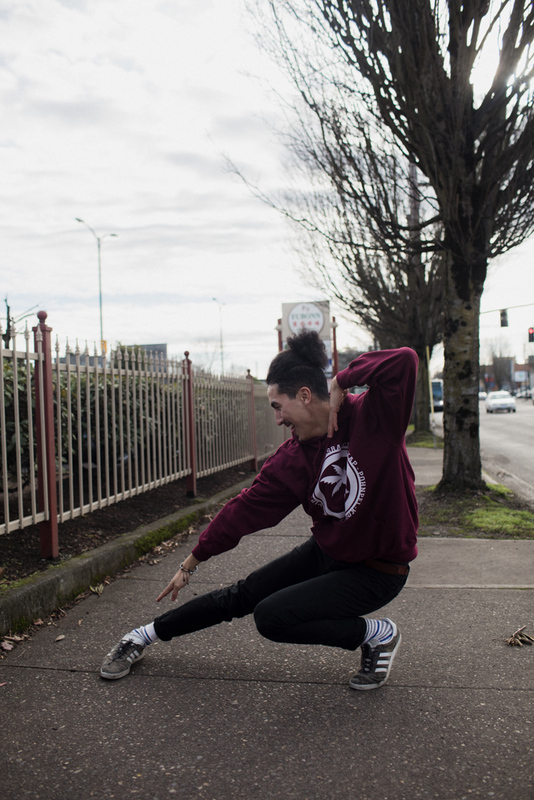 Simeon grew up in Portland feeling stuck in his Southeast quadrant, isolated as a Pacific Islander; but in the years since he found dance and began working at APANO, he has found that sense of belonging. In all of his movement work, connecting people has been its core. My dad is Pingelapese, which is one of the small atolls of the four main Micronesian islands, and so he's Pacific Islander. My mom is from Vietnam. She's a child who came out of the Vietnam War—my grandma being someone who was there and my grandfather being a U.S. soldier who came. My parents met at the Original Hotcake House. How did you start dancing and what role has dancing played in your life since? At a middle school dance, we had a dance battle. I was in 8th grade trying to [emulate] all the moments of You Got Served. We were just messing around. But that excitement, nervousness, and energy that took over when performing was something that I needed and wanted to do more of. Through high school my cousin and I would just practice in the living room until [I saw] an article in the Oregonian about a group of kids in our city also krumping. I showed up to the high school and challenged those students to battle! That's how I got introduced to the dance community here in Portland. I had to step away for a while during high school, but then I was able to get into school at Warner Pacific [College]. I started up a club [there] bridging folks in academia with people I met at krump sessions. Then when I was trying to graduate college, dance was the first thing to go again. [When] I started at APANO, it felt like a new chapter. I was like, this time I'm going to the dance community and I don't want it to be the first thing to go anymore because every time I leave, I become really sad. In 2016, I auditioned with 11: Dance Co. Their style is neofusion. I made it on as an apprentice. I was with them for almost three years but because [managing] a rehearsal schedule has been very challenging for me, I'm not part of any company as of September 2018. My DJ journey started last year through these events called The Collab. It was this creative hub. DJ Wool Beanie was holding monthly workshops on intro to DJing and was teaching me a few different things. After that, I got my own deck and started practicing, trying to get all the experience I could. Since I wasn’t dancing at the level to compete in freestyle events, I [wanted] to offer my talent with DJing. Now I'm more of a resident dance event DJ and I'm still learning a whole lot. You're involved with community organizing and environmental activism. Are your creative endeavors connected with those interests, and if so, in what ways? I definitely say they're connected. In college one of the things I'd do when I was trying to still find out my purpose in life was [ask] "If Simeon was its own non-profit, what would Simeon's mission statement be?" It was always about trying to create community and whenever there is a gap, [asking myself] how I [can] be that bridge between folks. There are times when [my interests] do overlap but I definitely want to be doing more. I'd like to see more leadership development within the dance community and recognition of the different institutional and cultural norms that can make it difficult to be successful. A lot of time, when I hear folks talk about dance, they use it as escapism and I think that is nice, but dance can also be the tool we can use to address these different things that are making life difficult. I get to see the overlap with environmental justice [and dance] with the group, Pacific Climate Warriors. This is a group of advocates trying to make sure our stories are getting told. The group is split between those living on the islands—on the frontlines—experiencing the realities of climate change, and the folks who are in diaspora like me [who] don't see those realities but also still feel really connected with our homes and want to do something about it. Our biggest tool is storytelling. What’s a project you’re particularly proud to have worked on? [In September 2018] I got to collaborate with Florence “Flo” Folole Tupuola and Nala Taukilo, two other [Pacific Climate] warriors in putting together a performative piece [called] Babies of Diaspora. It was really cool to feel like my whole being [was] engaged in that moment. [We] spent a week together [in Australia] choreographing and performing. Flo was representing the siva, a traditional Samoan dance, and I was introducing contact improv. Those two things were clashing and together in the piece, and then [we had] spoken word. We were [creating] awareness of the coal extraction happening. They're trying to actively stop Adani, the largest coal mine in Australia. The export route goes over the Great Barrier Reef, so there was black and red paint involved. Even though red is a color that is associated with power, the black paint blends and the red gets lost. Sometimes when [we] come to the movement, there are things we carry that get in the way and harm. When you have been hurt or harmed [and] that doesn't get addressed—what can happen is that you harm other people. I was representative of that person that comes in, trying to do good, but causes more harm. Contact improv is a very intimate dance. A lot of black paint was rubbing off onto Flo. Sometimes you just need to take a step back and really address and clean up things. That was a later part of performance—stepping away. We had bowls of water and a washcloth for cleansing. I'm really proud of that piece because it allowed me to have all these intersections of my being, but [spoke to] something that has always been on my heart; how do we continue to engage folks who cause harm? I don't feel good or believe in call-out culture. I know that sometimes it needs to happen and I understand that folks who come from privilege definitely need to be checked, but when it's folks in our own community, I don't know that call-out culture is helpful because we're already marginalized folks. Why do we need to ostracize each other even more? That performance, for myself, was for the day I end up, for some reason, getting called out and ostracized. More representation. API get lumped in together, but us Pacific Islanders are very different from Asian people and so I'd love to see more artists from the Pacific Islander community. And more accessible spaces for folks to get together because I know that's been challenging. At least for the Pingelapese community, we don't really do many things in Portland anymore because there aren't enough spaces. Our events are held out at this armory in Gresham. There used to be a time when we were doing things throughout the city. It's important for visibility. Also, if y'all wanna hire me, that's great. It would be very helpful! I'm hoping we'll be able to do year five of ADAPT, which is about bridging community between folks who exist in the studio and those who are freestyling, and trying to create an environment where both can exchange and learn from each other. Last year we had it in Beaverton and it was our first time doing an outdoor block party style. We hope to do that out here again in Portland in August or September.